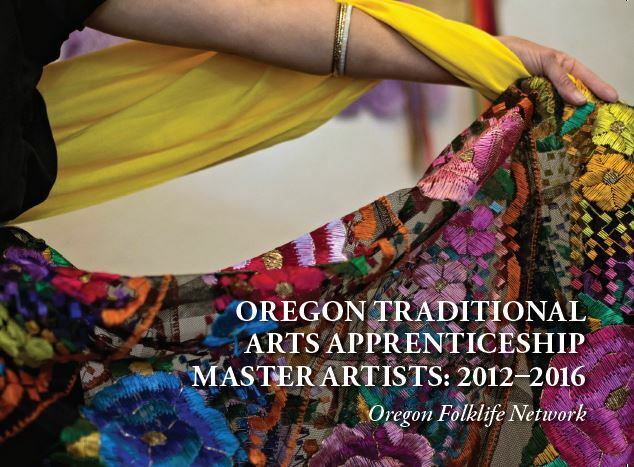 We are pleased to announce the release of Oregon Folklife Network’s latest publication: Oregon Traditional Arts Apprenticeship Master Artists: 2012-2016, featuring highly skilled traditional artists in Oregon. This publication and the Traditional Arts Apprenticeship Program in Oregon was made possible through grant funds, and so is not for sale. Instead, we share it for free with cultural organizations, libraries, funding partners, and elected officials. 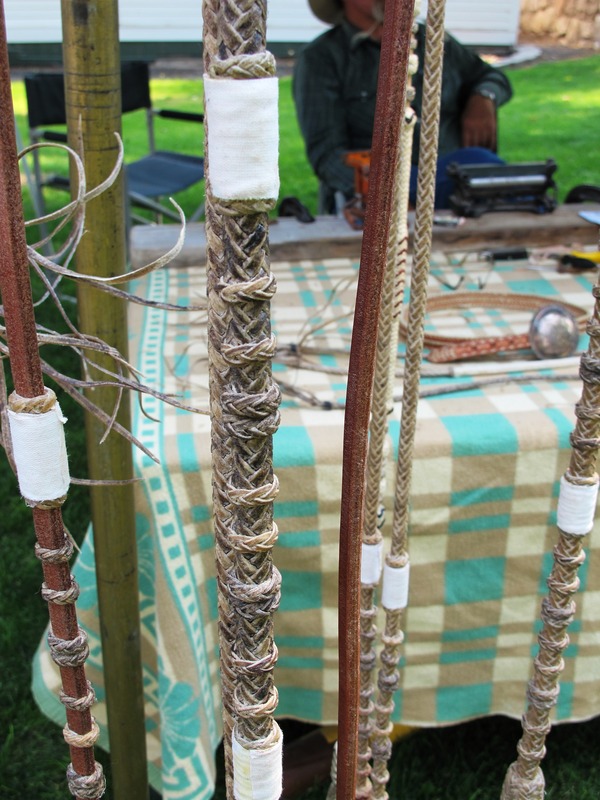 Doing so achieves key parts of our mission: investing in traditional artists, creating new outlets to show Oregon’s traditional arts, and providing public access to information about traditional ways being practiced in Oregon today. This book highlights the cultural traditions of those master artists who received TAAP awards from 2012-2016. Each awardee mentored at least one apprentice in an art form significant to their shared community, and all allowed us to document their processes. The book provides a glimpse into just a few of Oregon’s cultural traditions, ranging from Umatilla dentalium piecework and Palestinian embroidery to Czech and Slovak egg decoration and Plateau shell dress making. 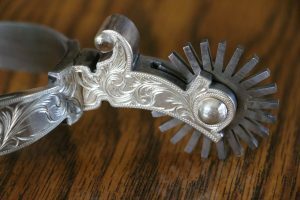 Included are western occupational art forms such as silversmithing, saddle making, and rawhide braiding, which speak to Oregon’s ranching heritage. Among the featured multicultural performance forms are Chinese rod puppetry, hip hop and rap, old time banjo, Guinean drumming, Indian Bharatha Natyam dance, and Mexican ballet folklórico. Throughout the pages, you will read the artists and culture keepers’ own words about their commitment to preserving and passing on their heritage. We share this book to honor Oregon’s diverse cultural heritage while raising public appreciation for traditional arts and artists. The Oregon Folklife Network, in association with our funding partners, is proud to present the master artists who keep Oregon’s traditional arts a vital and living expression of Oregon’s cultural heritage. Contact us for copies. 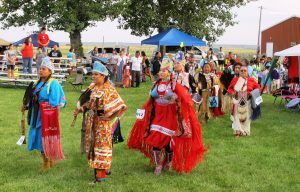 As the contract staff folklorist for the Four Rivers Cultural Center in Ontario, Oregon, I’ve been busy this summer developing public programs celebrating the traditional culture and folklife of eastern Oregon. 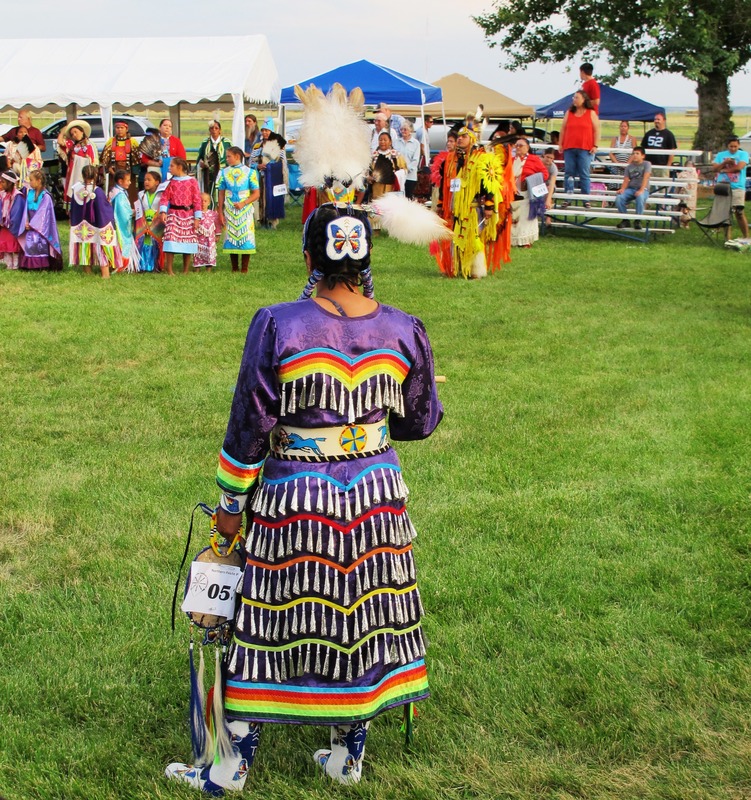 Although very rural, expansive country, there is an incredible diversity of folklife in the region. 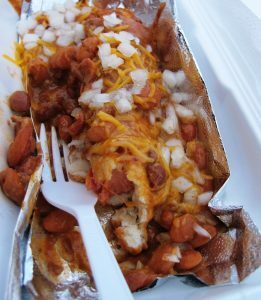 Native American, Basque, European, Hispanic, and Japanese represent a few of the constant flow of people of varied ancestries who have relied on the four rivers that converge in the western Treasure Valley—the Snake, Malheur, Owyhee and Payette – for which the Four Rivers Cultural Center is named. 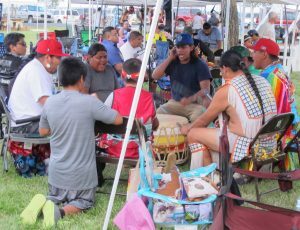 Each of these cultural groups have contributed their own folklife to the culture of the region. 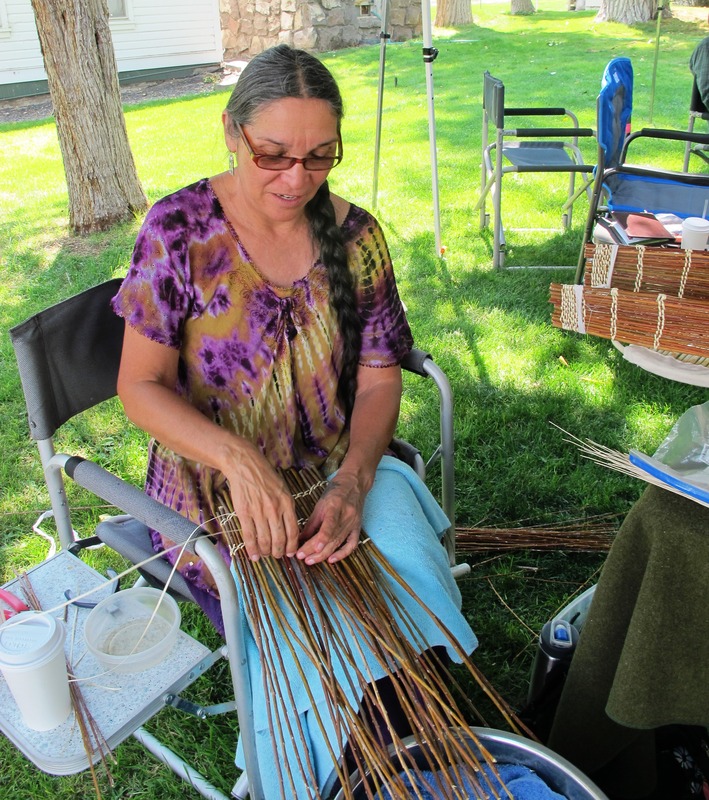 National Endowment for the Arts is funding the partnership between Four Rivers Cultural Center and the Oregon Folklife Network to hire a staff folklorist dedicated to supporting the folklife and traditional culture of eastern Oregon. Back in March, I traveled across the 8 easternmost Oregon Counties, holding listening sessions with County Cultural Coalitions, museums, arts centers, and Tribes, to learn what kind of programs people would like to see. Based on those meetings, I developed four programs collaborating with different host organizations and traditional artists spread across eastern Oregon in Ontario (Malheur County), Pendleton (Umatilla County), Frenchglen (Harney County), and Baker City (Baker County). 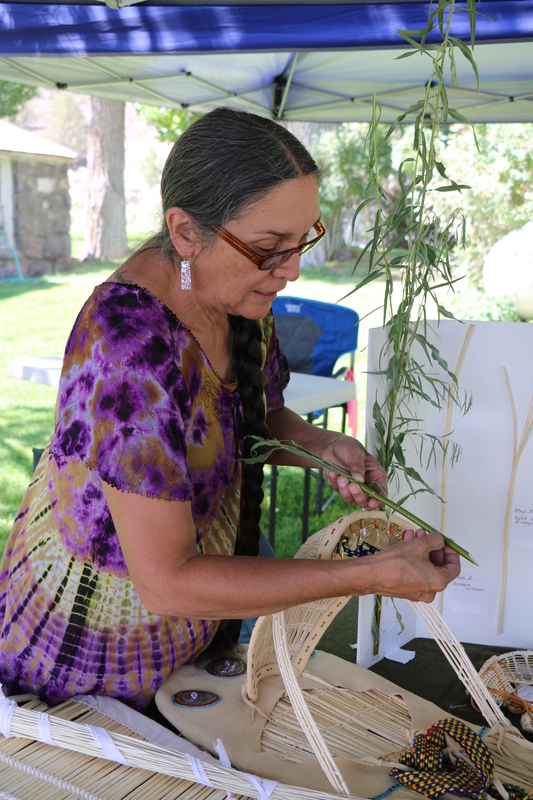 Highlights from these programs include a community conversation with James Dionne (Chippewa and Cree), a Native powwow dancer and sweat lodge leader in Ontario; demonstrations with various traditional artists like rawhide braider Dan Fowler, cradleboard and basket maker Sara Barton (Mono Lake Paiute and Yosemite Miwuk) during the Frenchglen Jamboree; a performance and conversation in Baker City with Ontario’s traditional Japanese drumming group, Kawa Taiko, and a community conversation with Native bead worker Margaret Johnson (Crow/Chippewa/Cheyenne, whose children are enrolled Umatilla) in Pendleton. Read a first-hand account of these programs in Riki Saltman’s article below. Sara Barton demonstrating willow preparation technique for use in a cradleboard in Frenchglen (Harney County), on August 5th, 2017. 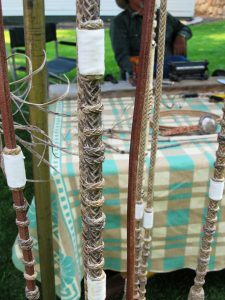 Next year, we plan to focus on buckaroo and ranching folklife, including functional traditional arts such as silversmithing, saddle making, twisting mecates, and more. 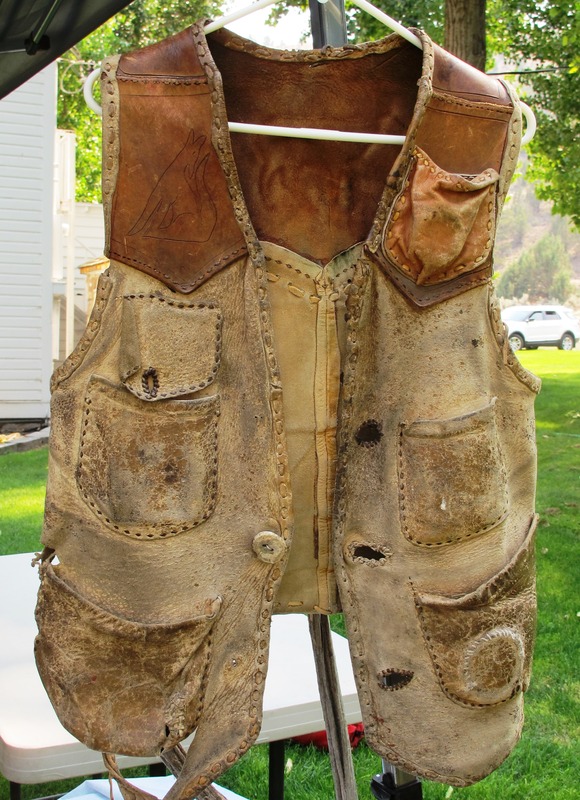 Keep your eyes open for next year’s exhibit exploring these traditions, and an all-day celebration with demonstrations of traditional arts, alongside performances of cowboy poetry and music. Stay tuned for more information as this project develops! Detail of a spur made by silversmith Forrest Fretwell of Jordan Valley, Oregon. Portland-based Hip-Hop artist Mic Crenshaw and his apprentice Baqi Coles, recipients of a 2015-2016 Traditional Arts Apprenticeship Program award. 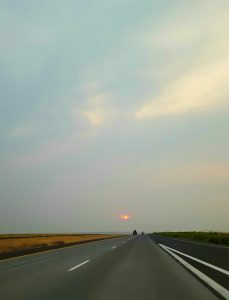 From August 4-7, 2017, I had the privilege of traveling about a thousand miles through eastern Oregon—to Burns, Frenchglen, Baker City, Pendleton, and back through the Gorge. I’m always struck by the vastness of our state, its overwhelming beauty, and the diversity of its terrain and eco-systems. 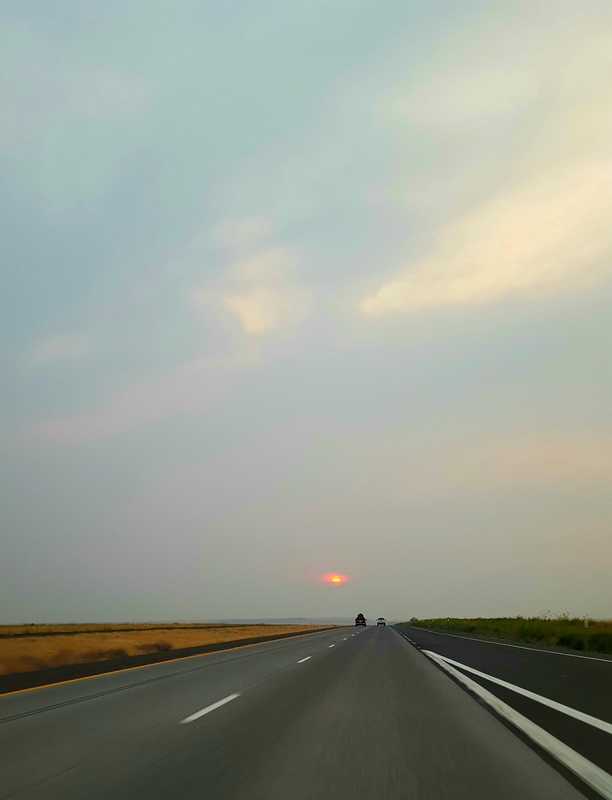 In a few hundred miles, I passed through many national forests, mountains (Cascades, Blue, and Steen), high desert, sage prairie, great basin, hot springs, some surprising wetlands, and lava beds. A smoky haze hung over all, due to the fires raging throughout the state. 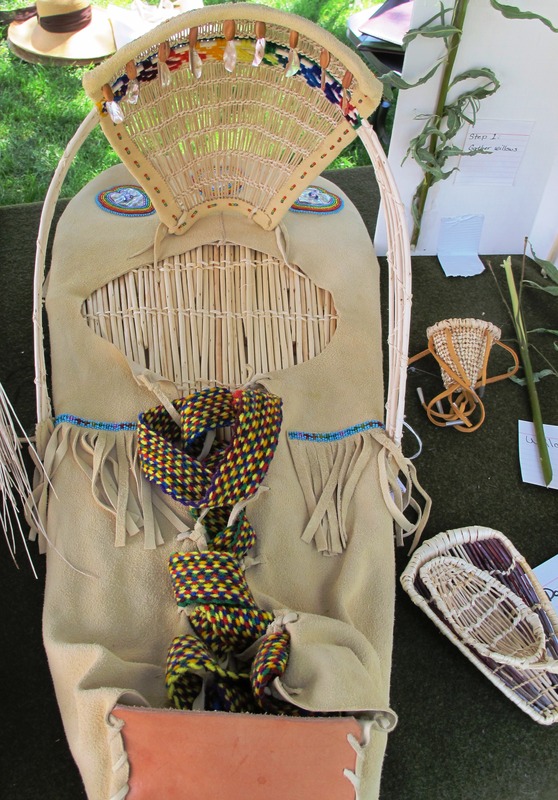 What brought me out of Eugene was the opportunity to attend two of a series of folklife programs that Four Rivers Cultural Center (Ontario) put together with cultural partners in Harney and Baker Counties. 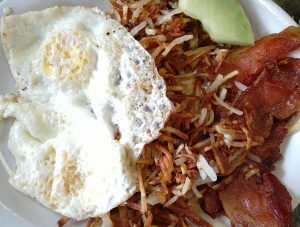 My family and I had a long drive Friday night, broken up by a wonderful dinner at Diego’s Spirited Kitchen in Redmond. 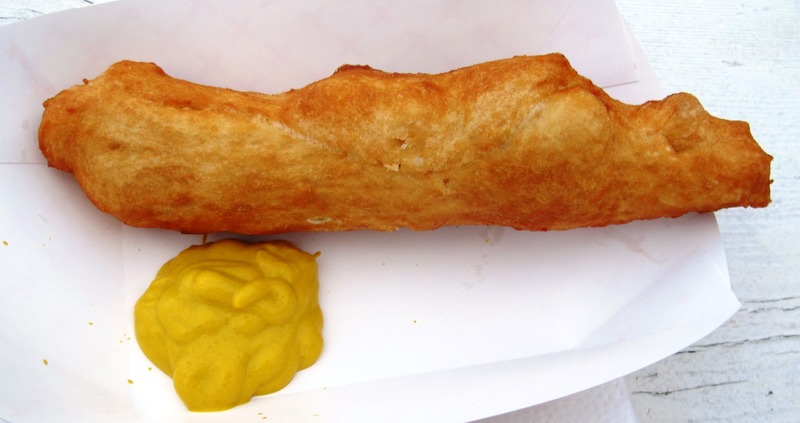 Douglas Manger, one of OFN’s contract folklorists, introduced me to Diego’s during his folklife survey fieldwork in 2016. It’s been a staff favorite ever since, especially the tacos de pescado with sautéed halibut. We arrived in Burns that evening, and the next morning my family and I set off for Frenchglen and the traditional craft demonstrations that Josh Chrysler, Four Rivers staff folklorist, had planned alongside the Frenchglen Jamboree taking place at the Frenchglen Hotel State Heritage Site. 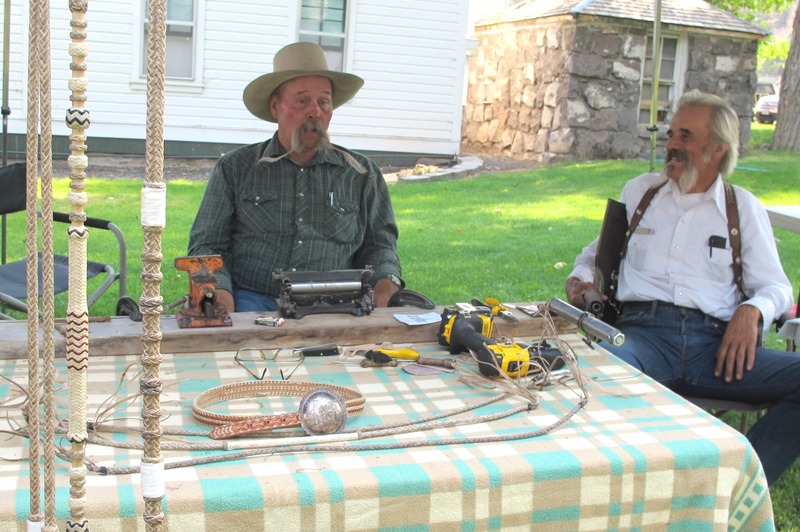 Read about the full scope of Eastern Oregon Folklife programs that Chrysler designed elsewhere in this newsletter. An hour’s journey through the mostly arid basins, along twists and turns, and over dramatic basalt ridges led us to Frenchglen, located on the edge of the Steens Mountain. 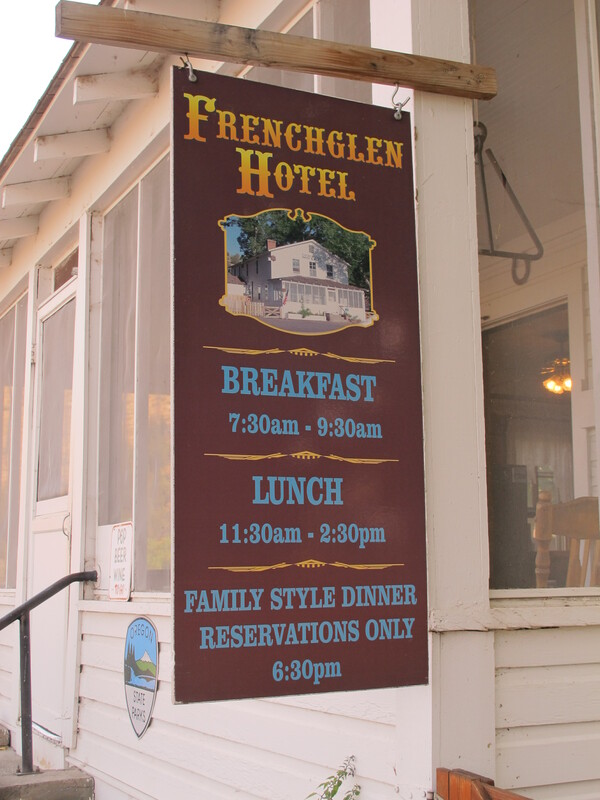 Frenchglen Jamboree, complete with a youth rodeo, included barrel racing, roping, and a spoon race as well as a Dutch oven dessert cook off, and live music. 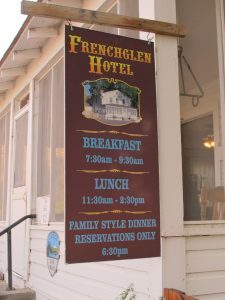 The folklife demonstrations took place on the side lawn at the Frenchglen Hotel, which was also hosting a cribbage match and a barbeque dinner. 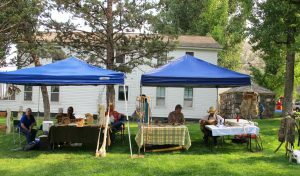 Under shady tents, we visited with Native beadworker, cradleboard, and basket weaver Sara Barton; rawhide braider Dan Fowler; and leather worker John O’Connor of the Steens Back Country Horsemen. Both Barton and Fowler are part of OFN’s Culture Keepers Roster. Barton, who is of Mono Lake Paiute and Yosemite Miwuk heritage, lives at the Burns Paiute reservation, where she makes and teaches folks how to make cradleboards for babies of different ages and sizes as well as a variety of baskets. 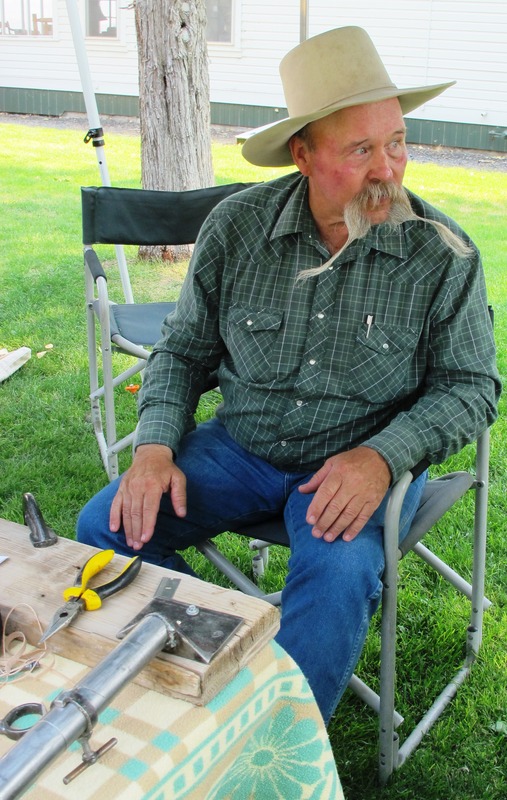 Dan Fowler, a long-time rancher and cowboy, is known throughout the region for his fine rawhide braiding. Each of the buttons—the intricately woven bumps on mecates, lariats, and comals—take hours to complete. 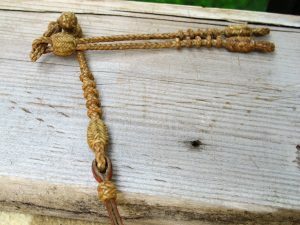 I was particularly charmed by the miniature reins that he had displayed, which are about 1/6 scale. O’Connor (on Fowler’s right), also a rancher and horseman, makes a variety of leather vests. Both he and Fowler regaled everyone with stories about horses (Fowler’s favorite “Old Strawberry”), rattlesnake dens, and more. 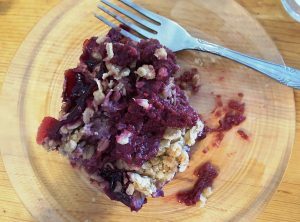 We also took a few breaks to sample the tasty food at the Hotel; the homemade raspberry crisp was a perfect ending to a meal of salads, burgers, and fries. After a full day in Frenchglen, we traveled through the stunning lava beds of Diamond Craters and the Malheur National Wildlife Refuge wetlands to Crystal Crane Hot Springs. 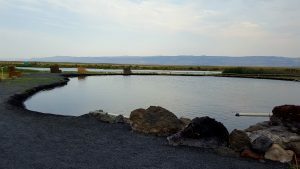 Soaking in the seven-foot deep hot springs pond, which hovers around 100 degrees, amidst the quiet, star-filled evening, was a true Oregon experience. 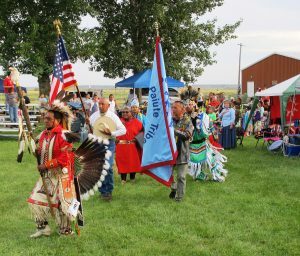 But before winding down, we drove back into Burns for the annual Burns Paiute powwow at the Harney County Fairgrounds. 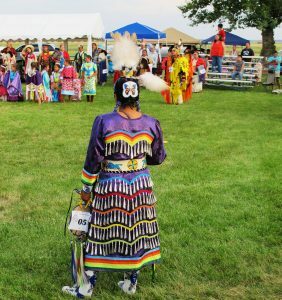 There we enjoyed a variety of traditional powwow dancers and their stunning, hand-crafted regalia. 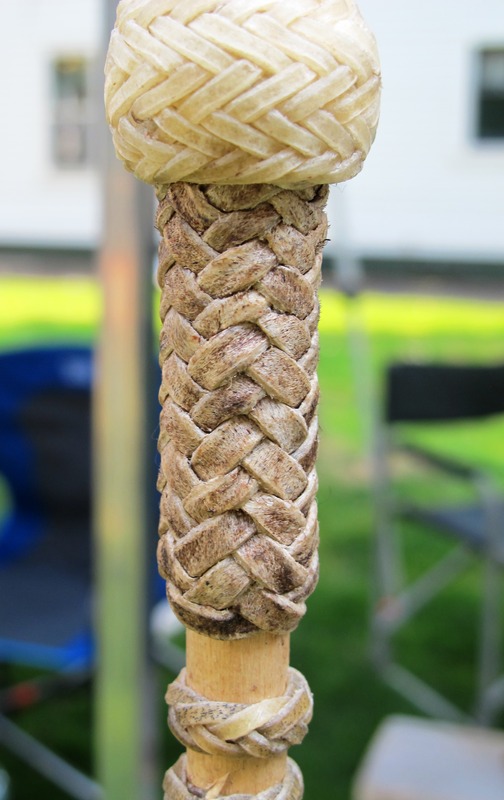 I found out later that some of the dancers had been part of OFN’s Traditional Arts Apprenticeship Program, which funded Burns Paiute elders, Betty Hawley, Myra Peck, Phillis Miller, and Ruth Lewis, to teach moccasin making to children ranging in age from 3 to 6. One of the benefits of attending a powwow is the yummy food. While we missed out on the meat and potato stuffed frybread, we did inhale some “rez dogs” (a hotdog wrapped in frybread dough and deep fried) as well as chili rez dogs (a rez dog topped with chili, cheese, and condiments). 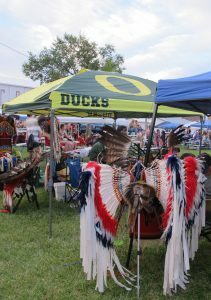 As we strolled around the powwow grounds, we even found some Oregon Ducks. The next day, we enjoyed a morning soak in the hot springs before a filling breakfast at Ed’s Fast Break & Grille at the edge of Burns. After breakfast, we journeyed north and east through the dramatic terrain of the Strawberry Mountain Wilderness as we made our way to Baker City and a performance and community conversation with Janet Komoto and the Kawa Taiko Drummers of Ontario, Oregon. Komoto and her Taiko drummers have long been a mainstay of eastern Oregon’s performing arts circuit. 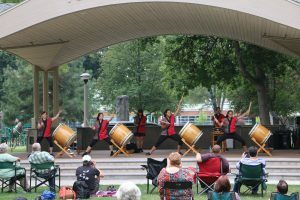 With the able assistance of Josh Chrysler, this traditional Japanese drum group performed and engaged with a crowd of about 100 on Sunday afternoon, August 6, at Geiser Pollman Park. In 2000, several members of Ontario’s Japanese American community came together to practice the traditional Japanese art of taiko. Komoto became part student, teacher, and group leader. 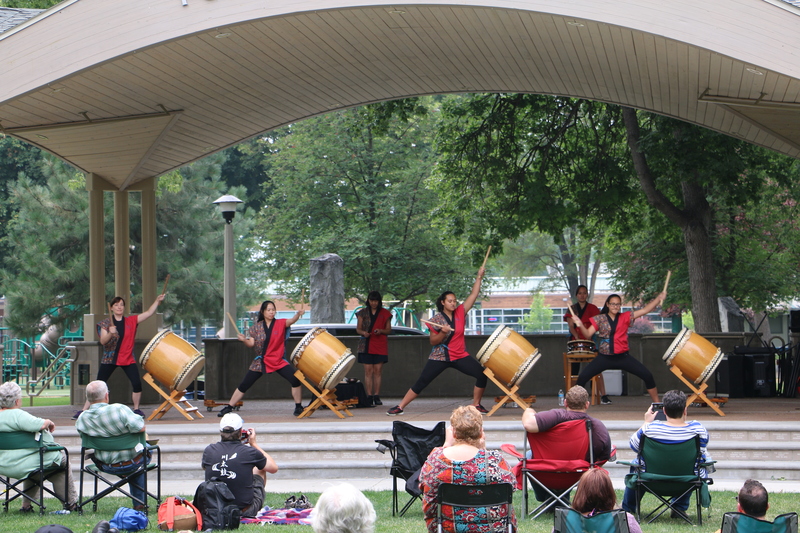 Thanks to Base Camp Baker for posting this video of the Kawa Taiko Drummers. 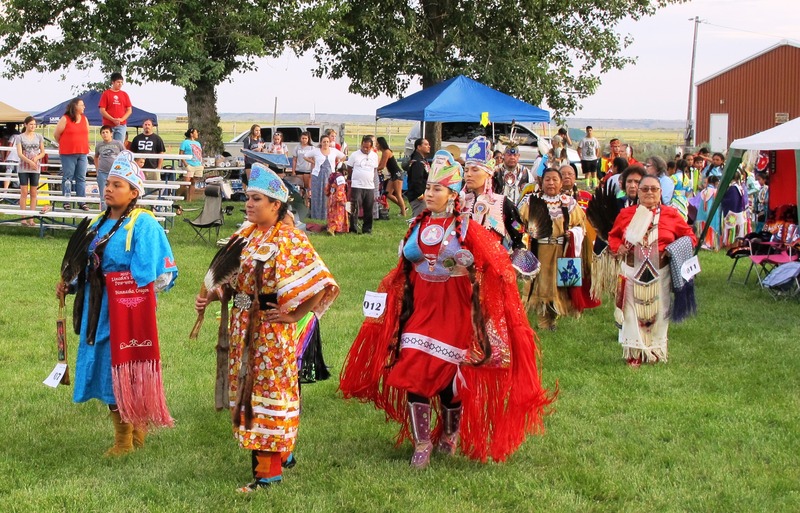 These programs were made possible by the Four Rivers Cultural Center, the Harney County Cultural Coalition, Crossroads Carnegie Arts Center, the Oregon Folklife Network, and the National Endowment for the Arts. Josh Chrysler, Staff Folklorist at Four Rivers Cultural Center in Ontario, developed this series of programs and exhibits that celebrate the traditional culture and folklife of eastern Oregon. 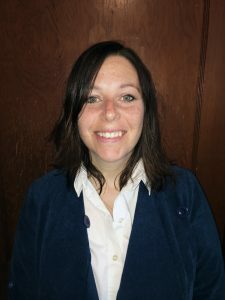 Each year, with funding from the University of Oregon’s academic Folklore Program, OFN employs a recent graduate of their masters degree program for one term, providing paid employment, job experience and resume enhancement while the emerging professional seeks permanent employment. OFN was pleased to retain former Graduate Employee, Alina Mansfield, as this Summer’s Graduate Folklore Fellow. 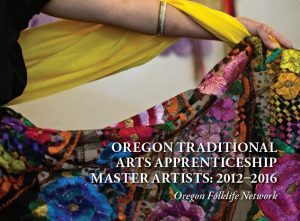 Mansfield recently helped write, produce and distribute our latest publication, Oregon Traditional Arts Apprenticeships Master Artists: 2012-2016 and has been actively updating OFN’s growing Oregon Culture Keeper’s Roster with traditional artists selected from our Gorge, Eastern Oregon and Portland/Metro folklife surveys. OFN is now part of the Museum of Natural and Cultural History!